Eastwood Design was contracted by The Canadian Physiotherapy Assocation to develop a new website with their ad campaign These Hands. The wedbite highlights the television ads that were aired during the 2010 Winter Olympics in Vancouver Canada. 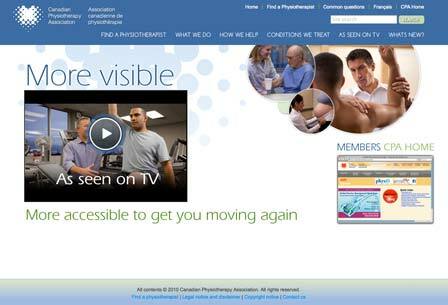 The website is specifically designed to infor the public about physiotherapy in Canada. The website is rich in resources on physiotherapy and also features a national searchable database to search for individual physiotherapists.